The mid-summer heat builds and park staff prepare for the day by raking the beach and volleyball court, collecting bits of trash, cleaning grill grates and tables and picking up after geese. Park manager Ron Faucher stops for a moment to describe the park. “It’s a real gem,” he says. A hidden one, as well. Faucher says many visitors tell him they’ve lived in Windham for years without knowing the park is here. On Presumpscot Road, Dundee Park lies along a quiet stretch of the river, shaded by trees and offering shallow-water swimming along a guarded beach, rental canoes and paddle boats, basketball and volleyball courts and plenty of shaded picnic tables. The town recently added a handicapped-accessible ramp to the park’s building, said Brian Ross, Parks and Recreation Director for Windham. The town has owned the park since the mid-1970s, said Ross, and it is a popular destination for fishing, swimming and boating. Mona Dodd has been live-in manager for 17 years. She tells Ross that the day before, a very warm Sunday, Dundee Park saw 569 visitors. Having staff live on site helps keep the property safe from vandals at night, she said. Dundee Park is open from 8 a.m. to 8 p.m. and offers bathrooms and a beverage vending machine. Day and seasonal passes are available for residents and non-residents. Day passes are $4 for residents and $5 for non-residents. Seasonal passes are $45 for residents and $60 for non-residents with discounts offered for children, seniors and active-duty military personnel. It’s the final week of National Ice Cream Month. Hopefully everyone has been celebrating at the area ice cream haunts. Want a summer project with the children? Try this recipe for making ice cream at home. There were many recipes online that included raw eggs and we wanted to make sure that The Windham Eagle readers could make these without worrying about raw eggs. Pour milk, cream, sugar and vanilla into the small can. Cover the can and duct tape well. Shake the can to mix. Put a layer of ice and rock salt in large can. Add small can and layer more ice and rock salt around the smaller can. Cover that can and duct tape well. Kick or roll the can for 10 to 15 minutes. Remove the small can. Scrape the ice cream away from the side of the can. Re-tape with fresh duct tape and put back in large can with more ice and rock salt. Kick or roll for 5 to 10 more minutes. Open can, stir, mix in your candy or fruit and serve. Ice cream in some form was thought to reach back to ancient times. Alexander the Great liked snow and ice flavored with honey and nectar. Marco Polo had a recipe for what is similar to sherbet. Ice cream as we know it was created sometime in the 1700s. In America, the first reference of ice cream was from a letter written in 1744. President Jefferson was said to have an 18-step recipe for what is now known as Baked Alaska. Once refrigeration was invented, ice cream became more wide spread. “Due to ongoing technological advances, today's total frozen dairy annual production in the United States is more than 1.6 billion gallons,” according to the International Dairy Foods Association. At the end of World War II, Americans ate over 20 quarts of ice cream per person in 1946. “Now, specialty ice cream stores and unique restaurants that feature ice cream dishes have surged in popularity. These stores and restaurants are popular with those who remember the ice cream shops and soda fountains of days past, as well as with new generations of ice cream fans,” said the International Dairy Foods Association. It was a nice night…nice night for a concert. A little jazz, a little gospel, some tributes and some great musical interpretations of songs we all know. It was a night of Music with a Mission, a monthly event presented at the North Windham Union Church. Daniel Strange played for us that night, Saturday last, at the piano, solo. Bringing back memories, while living fully in the moment, He invited his audience in to experience an opening of the soul performance of among other works, his work “Life as I Hear it,” his new CD. Now I’m not a reviewer, and this is not a review. It’s just a personal reflection of how I felt when I heard him play. I’m not qualified to review, but get it! Of course I loved it! You would have too! And if you were there, you did. As I write this I’m listening to Daniel Strange’s CD, “Life as I Hear It.” It’s great inspiration for writing about music. It brings me forward and back. So, let’s go back a bit! You’ll enjoy this, I bet. Back in 2002, Bellamey Jazz Band, a band I play in, had a gig…a big gig! A lobster bake for a major corporation at their ocean point location in Boothbay Harbor, but we needed a piano player to substitute for our regular pianist who could not make it. “Who’s this kid you got on piano Dave?” asked one guy. “Don’t worry, he’ll be OK” I soft paddled it. There were lots of tunes to know. “We’ll just ease him in and see what he can do,” I said choking back a little laughter. So we started…a little “Bye Bye Blues”…a song Daniel used to play with his grandfather. After a few times through Daniel took his solo, and our jaws dropped faster than the stock market in ’29. Sorry, I rambled a bit, but back to the concert…Daniel played a combination of his own compositions and his own renditions of the works of others. Gershwin would have been proud. Neal Heftic would have been proud. Billy Joel would have been proud. But most importantly I believe his audience was proud. I know I was…humbly. At different times during Daniel’s concert I looked around and saw the looks on people’s faces…some in awe, some just in calm enjoyment. Some were former teachers. They’d seen him grow up, play on the playground, practice in the music room. Our emotions varied. Some of Daniel’s playing brought back memories that created gentle smiles and the glistening of a welling tear, not in sadness but in the joy of the possibilities the mind imagines when hearing Daniel’s music. He’s our guy, you know. Local boy, grew up on Windham Center Road, but he has ascended to become a giant among musicians. He’s not a boy anymore, yet wise beyond his years, still a young man and a dad. Ladies and gentlemen Daniel Strange is a musician who would be comfortable on any stage in the world and he’d have very few peers…and he comes back to us yearly, nice for us! Now folks, it’s impossible to use words to describe music, but you can tell others how it made you feel. So I’ll just say, it was good…that good! Daniel Strange’s “Life as I Hear It”. It’s good hearing. For more than six years, Madeline Roberts did all she could for the clients of the Windham Food Pantry and clothes closet as the social service administrative assistant. She was planning on retiring next February, but in the end after some cutbacks and a new supervisor, Roberts decided that June 25 looked like the right time to make her exit. “Retirement’s looking pretty good right now,” she said. “I did what I could for the clients over the six and a half years I was there,” she said. “I made a lot of changes,” she added. The clothes closet, which was a disorganized room next to the food pantry, is now a five room, nicely sorted space. She also oversaw the revamping of the counter and new pantry shelves in the food pantry. She saw all of this work as betterment for the clients and for the town. “I was told I was too generous,” Roberts said. The need in Windham has increased drastically since the first year Roberts took over. The first year there were six seniors per month seeking help, now there are 53. Larger families have dwindled, but the food pantry still sees 170 families per month. Roberts also revamped the Christmas program, where children, approximately 240 last year, received presents from the generosity of people in the community like Ron and Judy Eby. She also started a backpack project for children heading to school. Each child received a backpack filled with school supplies. There was also a chance for locals to sponsor Thanksgiving baskets for less fortunate community members. After each donation, if she had an address, Roberts wrote the person or group a thank you note. “It doesn’t cost much to say thank you, but it costs a lot not to,” she said. “We really worked well and the community supported us,” Roberts said. The pantry also held fund-raisers like a bowl-a-thon, spaghetti supper and an annual yard sale. “The wonderful relationships I made and the support of people and businesses, those I’ll really miss,” she said. “I would like to be known as someone who had a lot of empathy for the clients in Windham. They were my concern and of course my beautiful smile,” she laughed. “Certainly not my height.” She also wanted to thank her clients and especially the volunteers who worked with her during her tenure. Roberts plans to stay active with social and human service causes within the community, but she’s not sure just how at this point. For now, she looks forward to spending more time with her 12-year-old granddaughter and family. “We will continue the work and we wish Madeline well,” Plante said. The position vacated by Roberts will remain open through the summer. Plante said that they would look into filling it in the fall. “The plan is to fill it,” he said. “I went in with the ‘do whatever’ thought,” Loft said. She was greeted with “You have beautiful eyes.” Loft left the styling up to Maley. In fourth grade I was a super-speller, that’s what they called it. But then the words got harder and my greatness ebbed, so a play titled “The 25th Annual Putnam County Spelling Bee” seemed a tad dry and out of my league, but was I ever wrong. The play, which I saw on its closing night, was a riot. I went with my 13-year-old son, only because I bribed him, however, we both laughed through the entire show. 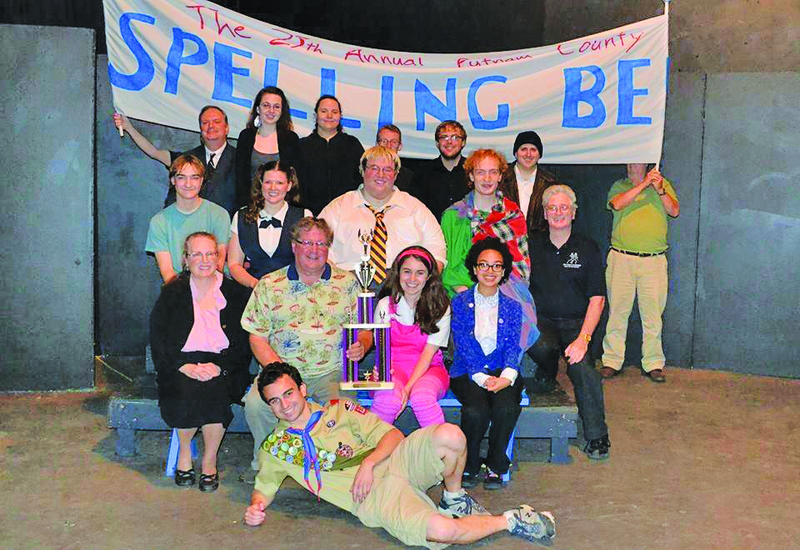 The quirky cast of characters had a passion for spelling, and came together for the annual “bee”. Each participant, looking to take the title and trophy back to their school, had to overcome something in their personal life, be it lack of confidence, not living up to the expectations of their parents or the unfortunate coming of age experience that rendered one contestant unable to focus on spelling. The cast was made up of only nine members, and each actor brought pizzazz into his or her roles. 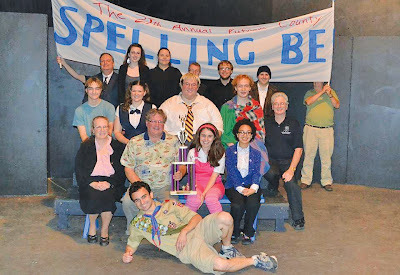 The show was interactive with the audience, which added a special element when someone you knew or arrived with was called on stage to be one of the spellers. This part made me wonder how much of the show was adlibbed. From the somewhat patient vice principal with an anger issue played by Andrew Goodwin to the guidance counselor who was doing his community service consoling the losers and handing out consolation juice boxes played by Jason Phillips, the one-liners and quick-witted dialogue had the audience laughing out loud. Adam Gary Normand who played William Barfee was perfect for the part showing confidence in his magic spelling foot and creating lots of laughs with his comedic timing. Molly Olsen played Olive Ostrovsky, a last minute spelling entry, who was an endearing character. Olsen’s crystal clear voice carried the important role opposite Normand. Another stand out actor and singer was Dillion Bates who played the Boy Scout Chip Tolentino. His dynamic ability to forget himself and engage the audience with what he was singing gave him the gold star for the performance. Angelica Phipps was convincing as a not so perfect person growing up in a home with two dads, who wanted her to be first in everything. Catholic school girl Marcy Park played by actor Kim Drisko was perfect for the part and as her character arc progressed she changed her acting style to meet the challenge. The final actor Benjamin Plummer played Leaf Coneybear, a dimwitted, goof ball who had a gift for spelling. He was great and showed his versatility by playing one of Phipps’ dads in addition to his other role. Casting for this play was right on, kudos to the cast and crew for a seamless performance at Schoolhouse Center for the Arts. The stage at floor level gives a whole new meaning to interactive theater. Look for their next performance of “The Music Man” starting July 18. Visit them online at www.schoolhousearts.org for more about the theater, their summer arts program and auditions. 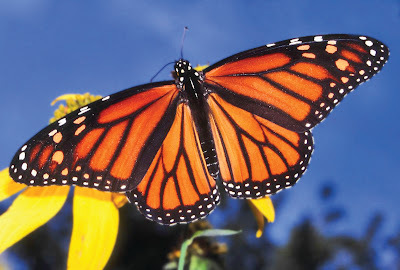 The monarch butterfly is one of the most revered butterflies not only in this country but this state as well, and yet sadly enough unless something happens its survival is precarious at best. How does this affect us you ask? Well the Monarch is an important pollinator and without it birds like the colorful Goldfinch may not exist. 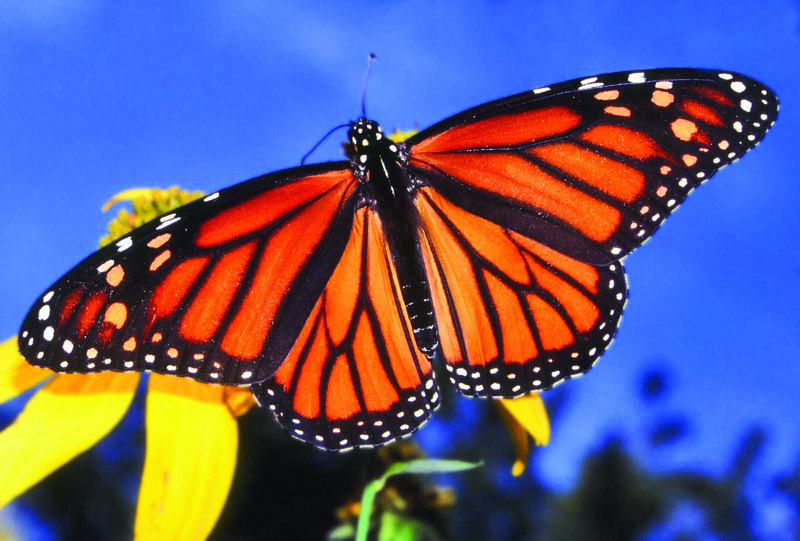 The Monarch counts its survival on of all things our veracious Milkweed. This weed as some would have us call it not only provides the Monarch with a primary nectar source, it also provides it with the only place to lay its eggs. After laying its eggs the butterfly has completed its task so the only thing left is for them to die. Yet not all is lost because their eggs quickly develop into a rather large larva (caterpillar). This colorful, yellow with black stripped veracious crawler quickly sets about to eat the leaves of the milkweed, one of the few insects that can do so until it develops into the pupal stage and then back to a flying adult and the process starts all over again. So you can see that without the milkweed this important pollinator could not exist here in Maine. Furthermore, given that the flying Goldfinch that nests in the fall uses the soft downy filaments tied to the milkweed seeds to line its nest, and given that unlike most birds this one nests in the early fall just when the earlier milkweeds go to seed…it's easy too see that this often disliked weed is an important element to the natural scheme of things. It was Darwin who once said that most things in the natural environment change slowly over eons of time, yet what often happens with man's intervention some things change quickly and not for the better. What can we do you ask? For one, where possible, even though many farmers may not like this idea because this weed often gets into the edge of open pasture areas, we can protect these areas. More to the point given how fragrant and colorful this weed can be up close with it's softball size clusters of pink nectar laden flowers, we can add a few if them toward the back of our perennial borders. Milkweed can be quick to try and take over, yet with some diligence we can keep them under control. Secondly we can also add other nectar laden plants to our gardens that the hummingbirds will also say thank you. You can use plants such as the taller annual Salvia varieties, or possibly some of the aggressive vines like the red trumpet vine, or some of the orange flowering honeysuckle. Hit the computer, do a search and you will quickly find sites where you can get not only some of the newer milkweed cultivars, you can also find other plants and ideas as well. So you can see that once we set our minds to it there is a lot that we can do to help. Remember foremost gone is gone, if we let this one go, what's next? Harrison Wood is a master gardener and is on the committee for the Windham Community Garden. Weeks of hard work and preparation paid off for Celine Baker when she was named second runner up in the Miss Maine’s Outstanding Teen pageant, the first pageant she has ever competed in. Celine, who will be a Windham High School freshman in the fall, spent five days in Brunswick last month, rehearsing with other contestants. The finalists were named June 22. Coached by Windham High School graduate Marybeth Noonan and voice teacher Janelle LoSciuto, Celine also attended some of the Miss Maine pageant workshops, designed to help contestants become more familiar with the pageant process and prepare them for the big night. In addition to the group dance routine, Celine performed the song “I Could Have Danced All Night” from My Fair Lady. When Celine, whose platform was anti-bullying, asked what she would do if she witnessed bullying, but was afraid to intervene and become the new target, she said she would go to a trusted adult. “You don’t want to put yourself in the position of being a victim. An adult has more authority to handle the situation,” she said, recalling her answer. 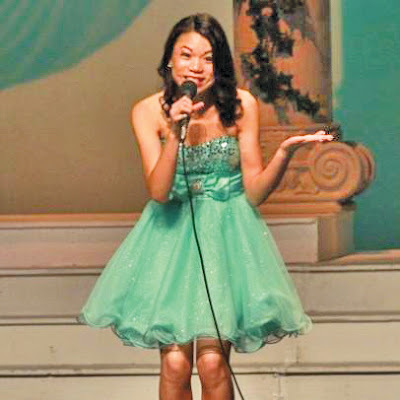 Miss Maine’s Outstanding Teen pageant began in 2005. 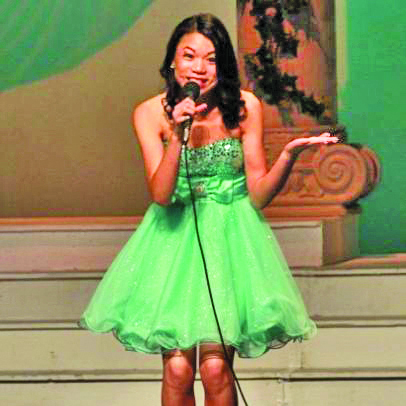 Celine was the youngest contestant to place in the top five in the pageant’s history. The recipient of a plaque and a $300 scholarship, she also walked away with new friends and the memories of an outstanding experience. Celine plans to compete in next year’s Miss Maine’s Outstanding Teen Pageant and will compete in the Miss Maine High School Pageant in Saco August 17. Somewhere along the line, my husband and I decided we weren’t busy enough with three jobs, two horses and who-knows-how-many chickens and ducks. We had an insatiable urge to put up more fencing and build more stalls. “Let’s get sheep!” we said. It’s been a goal for a long time – some sheep to help with grass management, offer some company for the horses and generally be adorable. We’re both avid knitters, and have wanted to produce our own wool for a while. A trip to the Maryland Sheep and Wool festival a few years ago settled it – we had to get Gotland sheep. This month, we did. Pippi, Hilma and Albin are partially Gotlands – a breed that hails from the island Gotland in Sweden. Karl, my husband, has Swedish heritage, thus the Scandinavian connection. Gotlands are descendants of Viking sheep, made substantially less ferocious over the centuries. Born black and gradually fading to gray, they grow a densely curly, blue-gray fleece highlighted with white and are a small, hardy creature. They’re kind and curious and not at all prone to marauding. Ours are pretty much like Labradors. They wag their tails and bleat when people walk by and they love back and belly rubs. Strangely, these don’t seem keen on being outside, but we’re working on that. We went to Pennsylvania to retrieve our first three Gotlands (more to come!) in a rented van heavily lined with tarps and equipped with one of those pine-tree things, for the smell. We filled the back with straw and hay and took off, making great time until we hit the New Jersey Turnpike, and then we crawled painfully slowly toward Maine. Even public radio and seriously powerful air conditioning couldn’t ease the sheep’s stress – they were pretty worn out and freaked out by the time we rolled into home at 1 a.m.
Karl and I were The Enemy the first four or five days. Back scratches won over Hilma and Albin, but Pippi remains convinced that we are not to be trusted. To her, we’re worse than the dogs, and she really can’t stand the dogs. I’m trying hard to win her over. I sit outside and read The Great Gatsby to them while Hilma and Albin walk all over me. They mostly want to be scratched, but they do seem to listen to the story and think the book itself is fascinating. Pages – turning! They’re going to be well-read ruminants. She figures there are upsides and downsides to having dunces for people. I’m pretty much a sucker for whatever she wants, but she has to tolerate my clumsiness while I learn more about sheep keeping. It’s hard taking on a new species, even if you prepare yourself reasonably well. Karl and I joined the Maine Sheep Breeders Association and have enrolled in the University of Maine Cooperative Extension’s educational program for emerging sheep entrepreneurs. It gives us access to classes and we take field trips to farms in the area. It’s an invaluable resource and we’ve made great connections with people who are already fielding our many amateur-owner questions. It takes a while to get used to their behavior, their quirks, them in general. Not an easy task all around, but so far it’s been rewarding, even if I have developed an ulcer from worrying over them. We’ve made friends with two-thirds of them and they seem content here – definitely cooler than they were in the mid-Atlantic. All in all, they’re riotously fun to be around and I get a kick out of their tolerance for my literary obsessions. If they keep humoring me, we’ll have to break out “Beowulf” next week. 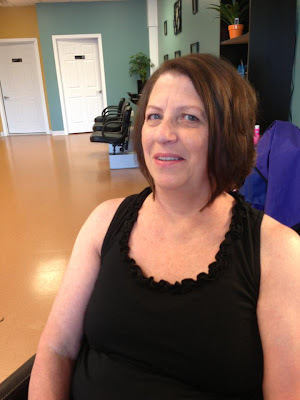 Susan Lowberg from Raymond is a cancer survivor who was nominated by her daughter, Carolee Parsons-Beaulieu to get a makeover from The Windham Eagle and Jessica Corson at Chic Boutique just in time for The Relay for Life, held in Windham this past weekend. 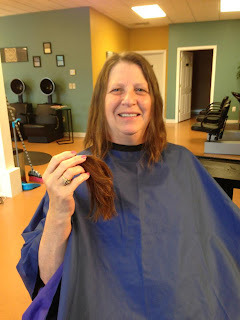 She wanted to have her mom show off her new look to family and friends, while celebrating her defeat of cancer. “It was great. Jessica was absolutely a doll,” Lowberg said. In November, Lowberg had a double mastectomy. When she went into surgery, they told her that the cancer wasn’t even at a stage listing, but once they took it out, they said it was actually stage 4 cancer. She is now cancer free and is thankful she didn’t have to go to chemotherapy. 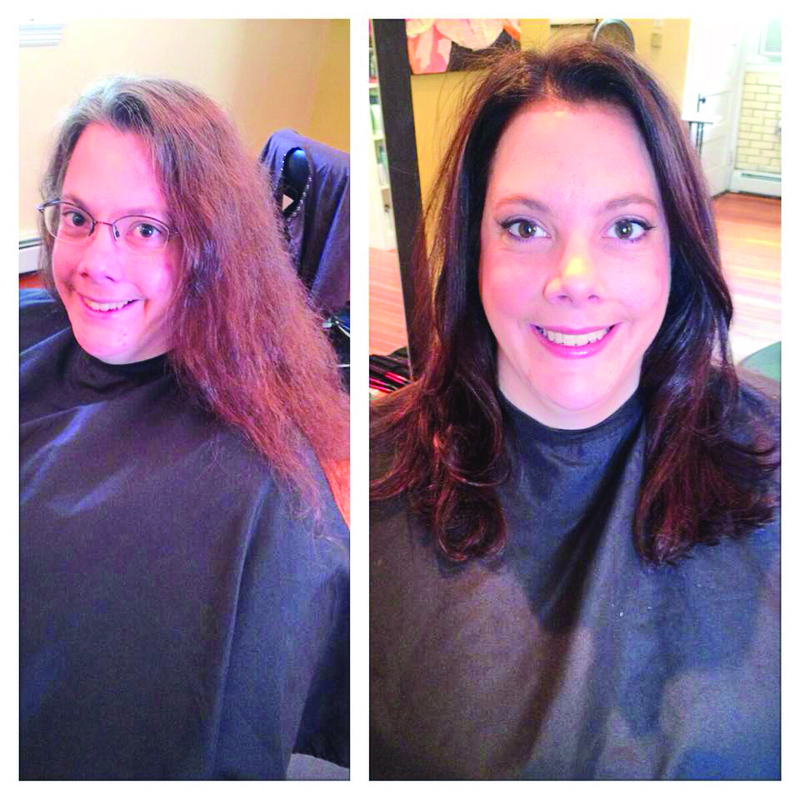 Wanting to surprise her family, she waited until Saturday to go for her makeover. Stylist Jessica Corson had a great time giving her a new look with subtle panels of two different colors to create a natural looking result that would wear well as it grew out. She cut about 10 inches off her hair and shaped it into a modern and wearable layered bob. She completed the look with an eyebrow tint and light makeup application. “Everybody really liked it. They said I looked 10 years younger,” Lowberg said. She also confessed that she doesn’t wear makeup and has never worn lipstick. “I don’t wear makeup and she did a makeover on my face. I’ve never wore lipstick in my life. I looked good. I might wear it if someone was at my house everyday to do it,” she said with a chuckle. She has already scheduled her next appointment to keep the hair cut and color. With warmer temperatures finally here, no doubt you have already started spending more time outside, doing yard work, taking in sporting events, perhaps walking in the woods. As you begin to enjoy the outdoors, please be on guard against the ever-growing threat of Lyme disease. In 2010, I sponsored legislation that made the month of May Lyme Disease Awareness Month. But with cases of the illness historically peaking in the months of June and July, now is the time to start taking precautions, if you haven’t already. Lyme disease is contracted when one is bitten by an infected deer tick, which is roughly the size of a poppy seed. The tell-tale early sign of Lyme disease is a bulls-eye rash, accompanied by flu-like symptoms, aches and fatigue. But one of the more menacing characteristics of Lyme disease is that in more than half the cases, no rash appears. Symptoms normally occur within the first month after infection. It is easily treated in its early stages with antibiotics. But long-term complications of Lyme disease are much more serious. They include arthritis, neurological and cardiovascular problems. Lyme disease has been reported in every part of Maine. Anyone can get it, but those most at risk are children under the age of 15, adults over 50, people who spend significant time outdoors, and those who are vulnerable to other types of infections. It cannot be passed on from one person to another. More than three quarters of Lyme disease cases are contracted within 100 feet of victims’ homes. According to the Maine Center for Disease Control & Prevention, there are a number of steps you can take to minimize your chances of contracting Lyme disease. • When you are outside, use insect repellent (that contains DEET), and apply permethrin (which kills ticks on contact) to your clothes. Some landscaping companies can also apply a special spray on your yard that will kill ticks. • Wear light colored clothing with long sleeve shirts and pants. This will allow you to spot ticks more easily. • Tuck your pants into your socks and shirt into your pants, creating a “no tick” zone. • Check your clothing when you come back inside and remove any ticks from skin and clothing promptly. • Keep your lawn mowed and clear of overgrown brush and leaf litter. When you return from the outdoors, you should check all over your body for tiny dark bumps, particularly in the “hot zones.” These include behind your knees, ears, as well as in the groin area, armpits, and under the breasts. To date, there have been no known deaths from Lyme disease in the State of Maine, but as I noted above, the health effects, when left untreated, can be debilitating and extremely costly. But if the proper precautions are taken, they can be avoided. Senator Gary Plummer serves Maine Senate District 12 which includes the Cumberland County towns of Casco, Frye Island, Raymond, Standish and Windham as well as the York County town of Hollis. Happily ever after begins with flowers. My friend decided to do her own wedding flowers, since I make it look so easy. Seriously! Do you think you can just throw a bunch of flowers together and expect them to look like a wedding bouquet? How about the handling and care of each flower. Wilted bouquets are just not in style. 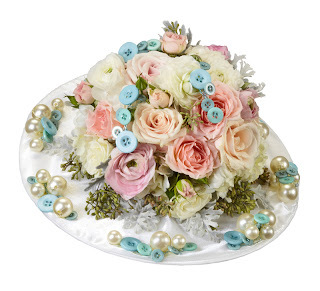 A bride should not make her own flowers just before her big day. Stick to smelling the roses and leave the work to the professionals. Weddings can be a challenge. Pace yourself as if you were running a marathon. 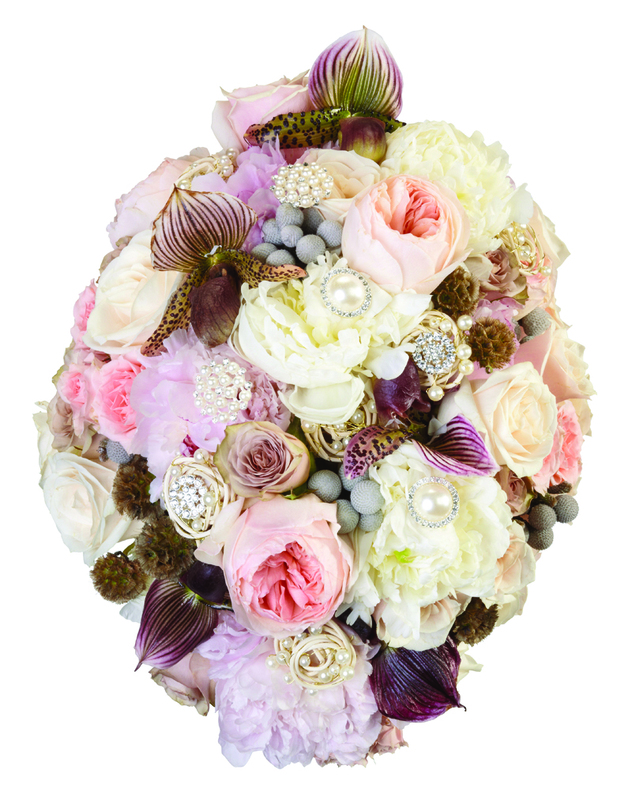 Many brides are overwhelmed when it’s time to pick out their flowers. A professional florist can help make your wedding an affair to remember. Select a florist you feel comfortable talking with, and develop a relationship. A florist once told me “Enjoy all the preparations and remember you’re planning a big party for friends and family.” Your florist has been through many weddings and will steer you in the right direction. Your florist will flourish under pressure unlike an amateur. Your dream bouquet and reality may not be one and the same. The flowers may not be in season and your florist can make recommendations. 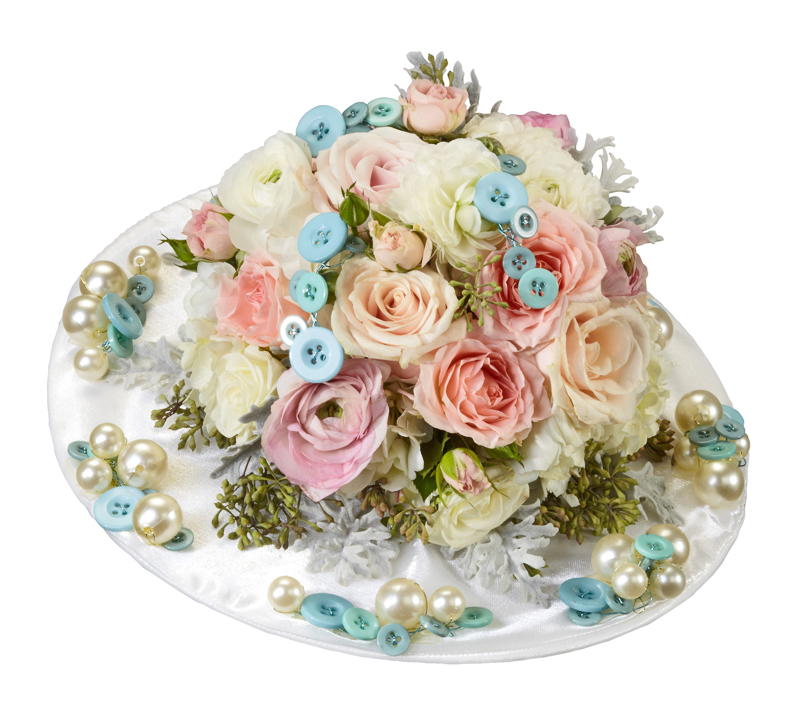 Flowers that are shipped in from different parts of the world can increase cost. Professionals can usually work within your budget, without compromising quality of work. Whether your style is organic wild flowers, bedazzled bouquets, or the latest vintage heirloom look, your wedding designer can personalize your style. This is your special day to cherish forever. It’s also your florists’ reputation at stake, and you can bet he/she is not going to disappoint you. Odds are you may need her again years down the road. All kidding aside, live in the moment of your wedding bliss. Leave the material items to the pros. I would like to talk about big old pine trees. Like us humans, pines tend to get a little brittle and lose flexibility when they get older. The limbs of an old pine tree can stretch out to 40 feet or more. Not only are these limbs getting more brittle as time goes on, but they are also getting heavier. Length plus weight equals leverage. Add in a pinch of brittle and you could have a disaster on your hands…or your roof… or your head. The good news is that these limbs often have a tendency to break off in the winter under the weight of heavy ice and snow. With a little luck, they will fall harmlessly onto a blanket of snow when no one is around. Many times I’ve been told: “That tree has been there a hundred years and it has never broken before”. The fact is, that it is bigger and heavier and more brittle than it has ever been before and it’s almost guaranteed that it won’t be standing there one hundred years from now. Hopefully, when it comes down, it will be in a safe and manageable way. If you have any question about your old pines or any other tree around your yard, please contact a competent arborist for an evaluation. The author is General Manager of Q-Team Tree Service in Naples and is also a licensed arborist.